This is the fourth album from Aldo Giuntini's metal project and is called 'IV'. He has the brilliant vocalist Tony Marin handling all the vocals on this album and the breath of Black Sabbath's sound (of course from the discs with Martin) is very significant. 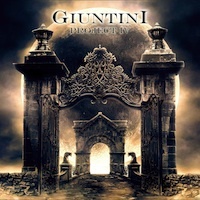 Mr Giuntini himself is a splendid guitar player and with support from Ezio Secomandi (drums), Dario Patti (keyboards) and Fulvio Gaslini (bass) makes this a powerful and mystic piece of rock music. Very heavy and DIO-'ish sound. Tony's vocals fit like a hand in a glove into Aldo's ideas of rock and the cooperation is working very well. No extraordinary new stars on the rock heaven, but a real solid and thoughtful record with a lot of heavy and guitar-based metal. Fans of Sabbath's era with Martin, and the heavier songs from DIO, Rainbow should enjoy "IV". Giuntini Project is something that should melt like ice in your mouth!